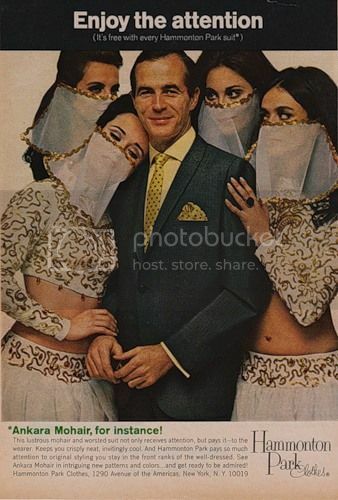 Apparently, if you're a successful white man, wearing Ankara Mohair makes you "crispy neat, invitingly cool", and grants you an instant harem! This was pre-Viagra, so there's no way that guy could keep up with his ladies, anyway. No sweat. When I saw this I felt, at least a man is concerned about getting attention. Usually in ads women are the ones who desire attention from a human (man). This gives men the power to give attention or not. It was kind of refreshing to see a man want attention. I'm so tired of ads telling me to be the object of men's attention. I'm literally physically tired of the eyes on me. Why can't a man try to show off his beauty and get my attention? Why can't a man be the object of my gaze for a while?